Calmais Omar Sosa’s fifth solo piano recording. 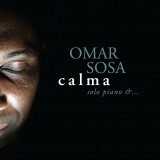 It is a work of singular artistry, featuring Omar’s unique and original approach to the genre. The CD is comprised of 13 solo piano improvisations, fusing stylistic elements of jazz, classical new music, ambient, and electronica. As the title implies, the overall feeling is relaxed and introspective, without any attempt to impress technically. Rather, the intent is to evoke a mood of reflection and contemplation. Rhythmically, the feeling of the CD is unhurried and meditative. Sensations of floating and suspension of time prevail. Only on Aguas (a version of Across Africa from Omar’s GRAMMY-nominated CD Across The Divide) and Dance Of Reflection (a version of Omar’s signature composition Muevete En D) do we encounter a more energetic tone. And melodically, the thematic material on Calma is quiet and restrained. We can imagine the melodic sensibilities of Erik Satie meeting those of Pierre Boulez. A must-add to your solo piano collection. Great album, Omar!